Excuse me if my English is not 100% correct. I'm in a debate with a lot of chemtrail believers in which I am the scepticus. I use this website as a resource for a few months now and I thank you all for the helpful explanations and references. Recently a rainwater test result popped up and I need to know what the acceptable value for Aluminium is. I've looked around for it and learned a lot about it, but the answer is still inconclusive to me. In will enclose a picture of the results for your assessment. I thank you in advance for any provided help in this matter. Rainwater essentially has random amounts of aluminum in it, depending on how much dust there is in it, and the type of dust. So there is no real "acceptable value". Plus the collection methods can have quite an impact. If done poorly then the majority of the aluminum can actually come from deposition - i.e. the settling of dust, and not from the rain. The EPA sets a cosmetic limit for drinking water of 2000 µg/L, and your test shows slightly higher. But this is simply for taste and clarity. Update, actually 200 µg/L, for color. No limit for health. What is the source of the picture and of the test? The listing of aluminum seems out of place it's in bold. Mick, I have the same reservations to the conditions of the test. Thanks for the 2000 µg/L . I've encountered numbers like 6 ppm. Which would be 6000 µg/L . Right? But I can't find any official confirmation at EPA. Only 750 µg/L for ambient water. SR1419, That's the first thing I noticed as well. Odd. its also out of alphabetical order. weird. what language is that. maybe 'aluminum' is like 'zytvatavik' in that language, so they just changed it for ease of read? The Agency for Toxic Substances and Disease Registry (ATSDR) of the CDC publishes the "Minimal Risk Levels" (MRLs) for various chemicals. An MRL of 1 mg aluminum/kg/day has been derived for chronic duration oral exposure (≥365 days). A 70 kg person could drink 26 liters of that rainwater each and every day and they would suffer no ill effect from the aluminum. Of course, drinking that much water would kill you. perhaps the OP can clarify on this one. I tried an online translator and used both Dutch (OP said from Netherlands) and from German with interestingly mixed results. German produced a better match for many of the other elements like Antimony, chromium Selenium etc, but Dutch produced a better match for Zware metalen (heavy metals) and diversen water. Both languages just translated as aluminium, but online translators will just pop the same word in if it can't find a match. The main list of metals is heavy metals (zware metalen). Aluminium is not a heavy metal, so I assume that is why it is listed separately. The list is in the original Dutch: the Dutch word for aluminium is the same as the (British) English. There are many instances on the internet, of the rumor that "there should be zero, or near zero" aluminum (or any other substance found in these tests). This is an absolutely false notion that has been passed from one person to another, on the internet. You will never find that idea in any textbook, in any university, or among working meteorologists or other atmospheric scientists. I don't know if these believers you are in communication with, are claiming this false theory......but they sometimes do. Simply one test result by one person, in one area....is not enough to come to a conclusion to become meaningful data. There are too many ways to get an "abnormal" test result, especially if proper procedures are not followed. To begin to assemble meaningful data, repeated tests should be preformed properly and documented (photos/video). Then, the results can be more significant, and trusted. If something is registering "high" in these series of tests....they should start looking for the source >>>>beginning at the test procedure, the area immediately around the test site....and outwards. Was the test preformed properly ? Was dust allowed to accumulate in the sample(s) ? Is the test site near a dusty field?....or near a construction site, or a busy street, under a roof or tree ? You look for clues from the test site, and work outwards, to find the source.......you don't start looking outwards (far away).....even if you suspect the source might be far away. It's first a process of elimination. If you haven't noticed already, the lack of people posting test results of normal or low levels of aluminum. The VAST majority of these tests show extremely low levels. People do not boast about their low/normal tests. What is interesting about this result is a high value for Zinc, 37% of the Aluminium value. If it were a normal dust, I would expect the ratio Al/Zn being about ten times higher. On the other hand, the values of other major contaminants, Lead and Copper, give expected ratios relative Zinc. I'd say that this water sample probably was very dirty, but the relative Aluminium content of this dirt was very low. It's also important to stress that the results do not mean that there is metallic aluminium present in the water. Note the testing technique detailed at the top: ISO 17294-2, ICP-MS.
That is an international standard test method (you can read the abstract at http://www.iso.org/iso/catalogue_detail.htm?csnumber=36127) which uses a technique called ICP-MS (inductively coupled plasma mass spectrometry). So any substance containing aluminium, whether that is aluminium oxide, or clay, or granite rock, or whatever, will be broken down and give a signal for aluminium ions. A claim we often hear is "aluminium isn't found in its elemental form in nature, so it shouldn't be in our soil/water!" It isn't! Interesting. Assuming that the address at the top of the analysis is the location the samples were taken from, I had a look to see if it had a zinc roof or anything like that. Not that I can see, but it is less than two miles from a local galvanising factory, which of course uses zinc. I wonder if there might be as link? I may be veering off topic here, but thought it was worth mentioning! Yes the report is in Dutch, which is not German. (I know, it's confusing). Aluminium is Aluminum. The extra 'i' being the only difference. Why the Al result is so out of place, remains odd. I've now found a value for secondary drinking water = 0.05 - 0.2 ppm on the EPA site. So the test value would be 13.5 times higher. That sounds alarming. Now, I'm going to dig in deeper about the test conditions and the validity of this report. So far it looks like a Word document that I could have produced myself. Thanks all and to be continued. 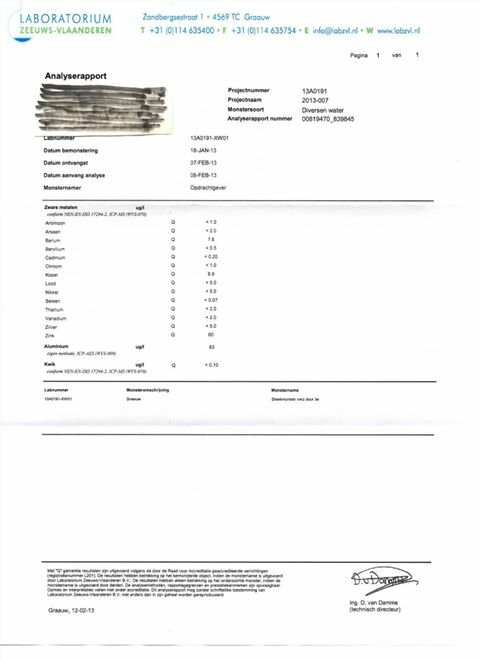 Also he collected the sample on 24 march, but it took a week to get it analysed. What was the container he caught the water with? Where was the sample taken etc etc. I'd incorrectly said 2ppm before, but that was the level for barium. The 0.2ppm EPA level is a secondary contamination level, and is just for visual appearance of the water. The EPA sets no limit for health. EPA has established National Secondary Drinking Water Regulations (NSDWRs) that set non-mandatory water quality standards for 15 contaminants. EPA does not enforce these "secondary maximum contaminant levels" or "SMCLs." They are established only as guidelines to assist public water systems in managing their drinking water for aesthetic considerations, such as taste, color and odor. These contaminants are not considered to present a risk to human health at the SMCL. Color may be indicative of dissolved organic material, inadequate treatment, high disinfectant demand and the potential for the production of excess amounts of disinfectant by-products. Inorganic contaminants such as metals are also common causes of color. In general, the point of consumer complaint is variable over a range from 5 to 30 color units, though most people find color objectionable over 15 color units. Rapid changes in color levels may provoke more citizen complaints than a relatively high, constant color level. Standards related to color: Aluminum, Color, Copper, Foaming Agents, Iron, Manganese, Total Dissolved Solids. I remember a discussion I had about a similar (but with different values) report from "Chemtrail Benelux". This 2 year old sample (this was snow) looks pretty much the same, but you can see what the original sample was at "Monsteromschrijving". Why is that left out? This report also describes what the "Q" means. (sorry no time to translate right now). They were also shouting the levels were much too high for this 2013 report. However if you compare them you can see ALL levels have raised very much. I can't find what the weather was around Helmond but I think we had some rain the last week of March. But again, the aluminum in rainwater comes from dust. Depending on where you live, the dust can have as much as 10% aluminum. So really you are not measuring aluminum contamination, but rather how dusty your rain water sample is. This dust is largely removed during drinking water treatment. But again, the aluminum in rainwater comes from dust. Yes, that is why I'm curious about what it says about what kind of sample it was (the "monsteromschrijving"). I'm wondering why it is left out, maybe they would type this sample as 'sludge'. Also the time between sample and analysing it might be an indication it is maybe a sample left outside for multiple days to collect. (which of course could be a cause of all numbers being large, collecting a lot of dust..). It's really not alarming at all. It's comparing dirty rain water with the limits for treated drinking water. 2700 micrograms per litre is 2.7 parts per million. Bearing in mind that soil is around 7% to 8% aluminium, this equates to around 35 parts per million of soil in the water, or 0.0035% of soil contamination. In other words, take a pint of water (~500ml) and drop in 17 milligrams (less than one thousandth of an ounce) of soil. Probably OT but whats a "aluminum anode system?" Where are you finding that phrase? An aluminium anode system probably refers to a "sacrificial anode", which is a piece of metal that is connected to a metal object at risk of corrosion. The sacrificial anode corrodes preferentially and protects the other metal. It's just an electrode made of aluminum. not really confusing I assumed it was Dutch, but an online translator didn't translate most of the other elements the same as on the list, when i told it to translate to Dutch but did when I asked for German instead. Being British, I spell aluminium with a second I as well. Important to note that the World Health organisation is FAR more concerned with Aluminium in our FOOD, particularly from some food additives and is estimating we take in between 5 and 7mg of Al a day from food. this does seem quite a high figure for the water sample but as there is no real chain of custody and we don;t actually know exactly how the sample was taken or exactly where from it doesn't really show us anything. Average values for all these elements do seem to be being taken on a regular basis and do not show anything untoward. I asked the tester in private (on FB) how he did his test, what procedure he followed and what it all costed. 12 hours ago. No reply yet. No, why would it be? It's not drinking water. Applying drinking water standards to rainwater is meaningless. The largest effort so far that I know of was "The Chemtrails Project" here in the USA. What's up with those anomalous samples? Do we know what they actually tested? some of them also seem to be suspiciously round numbers. FOUR places had EXACTLY 5000. Zero strontium in all samples, yet the movement continues to bray about that being a major component of "chemtrails". I apologize for dredging up this old post, but researching allowable "aluminum content in rainwater" led me to the group. I'm intrigued by the great posts here and joined. If I may ask, I'm wondering if any opinions have changed in the 3+ years since the thread was started? For me, I've purchased a tester to begin monitoring the AL 3+ content in my rainwater here in in the National Park area of NE Ohio. I've read a lot of posts about dust and industry, but my belief is that in my specific area, the ppm value of ionic Aluminum in our rainwater should approach zero. I'm early in the process as have only taken a few samples. We've had days of rain here which to my (maybe naive) way of thinking should have washed any "dust" away. I guess there is the possiblity that dust was dry downstream weather-wise and rose into to atmoshphere, condensed and dropped on me dozens or hundreds of miles away (I'm also researching industry downwind of me, but again early on in my quest). What I did notice is that when posters seemed concerned above, moderators or senior menbers seemed to quickly try to quell any fears of aluminum in the air. - there should be zero (or low amounts) of aluminum in rainwater is an "internet rumor"
- the repetition that "the aluminum in rainwater comes from dust"
- that the presence of aluminum is "really not alarming at all"
Can you explain what you are basing the "approach zero" claim on? Also, what's the make and model of your tester? One that caught my eye was the "Chemtrails Project Data Analysis" image (in post #28 just above) where nearly half (32 of the data points) are 0. What I can't tell for certain is if the positive values are in ppm or ug/L. IF ug/L the values are relatively low, but still many over the EPA's drinking water range of .05 to .20 ppm which might indicate a cause for concern to some. IF ppm, the wide range from 0 to 10,500 (netting out anomalous) is simply confusing. I do understand that particular report was collected by a different person at each location which could introduce methodology differences. I have a new eXact Micro 20 that has been used only to test rainwater falling into a plastic rain gauge mounted 3 feet off of the ground, and where the mouth of the gauge is higher than the post to avoid interference / contamination. If I need to change methodology I will be glad to listen to suggestions as this is something I plan to do after every measurable rain. I'm also going to start tracking sample pH. I think those are different tests. Al3+ and Aluminum content are not the same. Al3+ is a dissolved form of aluminum, but the tests above are for total aluminum, which includes suspended solids (dirt) with Aluminum oxide (and theoretically metallic aluminum, but that's unlikely). Still your levels seem high for Al3+. I suspect though that it's quite tricky to get an accurate reading. Rainwater is acidic and will leach Al3+ from any dust in the container. Can you verify the accuracy of your tester by testing water from the same sample three times in a row? Are you flushing the test cell with acid before the test? Not sure what this measures. The instructions say 5 drops of "Al buffer" have to be added to the sample. This buffer may be acidic, so it dissolves the solids. If that is the case then you are in fact measuring the total aluminum. The values seem fine to me. Never understood why rainwater values are compared to drinking water standards. I've cleaned the unit with vendor supplied brush and muriatic acid as specified by eXact and yes, I can verify at 0 to .01 variance between samples. Again, I have a very small sample group so will expand over time. I'm using the EPA thresholds only because they are all that seem published by an entity that attempts to monitor / control / mitigate bad things in the environment. I just personally don't believe Aluminum would be in their repertoire of things to measure and set limits upon if it was a good thing. Sharing: my Dad passed on earlier this year with dementia / Alzheimer's. My wife, 4 children and I are in this same environment and I'm looking to mitigate sources of Aluminum from it. These contaminants are not health threatening at the SMCL. Public water systems only need to test for them on a voluntary basis. Then why it is necessary to set secondary standards?